Much ink has been spilled lately over the blood of Cecil the Lion, killed by an American safari hunter/dentist in Zimbabwe. 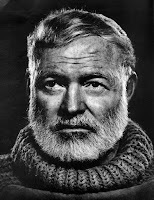 In 1935, Ernest Hemingway wrote The Green Hills of Africa, a nonfiction novel published 30 years before Truman Capote kindled a literary genre with In Cold Blood. Hemingway recounted a safari trip to Africa and his killing of a lion. It wasn't named Cecil, but what's in a name anyway. A lion by any other name is just as dangerous. What's it like to shoot a lion? Hemingway's narrative gives us some idea. I was so surprised by the way he had rolled over dead from the shot after we had been prepared for a charge, for heroics, and for drama, that I felt more let down than pleased. It was our first lion and were were very ignorant and this was not what we had paid to see. This novel is often ignored and not even mentioned as an early example of the "nonfiction novel" genre which became integrated into literature several decades later. Hemingway's most famous story of a lion hunt is his short story "The Short Happy Life of Francis Macomber," considered one of his best. I think people sympathize with lion deaths because they are seen as an animal that has been encroached upon by humans and are becoming endangered as a species. We don;t hear much about lions mauling people, but instead about safari hunters arriving from the West and shooting them for fun. Contrast that with the way we view sharks. The only time we hear about them is when they are biting off the arms and legs of swimmers. They seem to have the "upper hand" in a way lions don't. You don't hear much in the way of remorse for the killing of a shark.